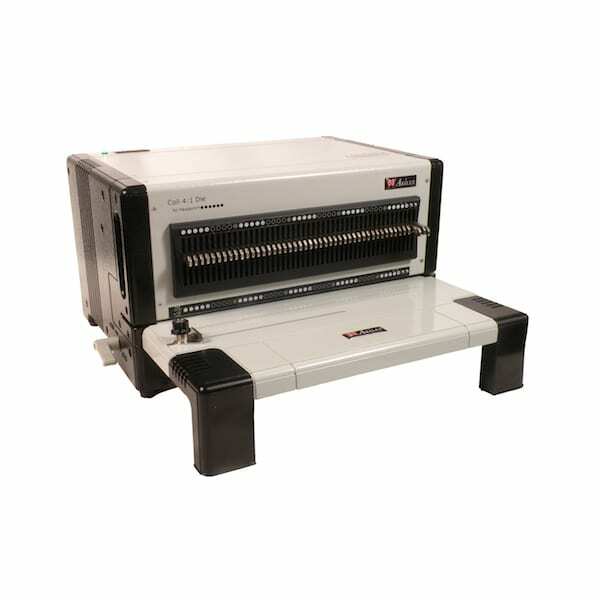 FlexiPunch-E is a versatile modular punching machine with an affordable price that gives you the binding options you need in everyday work. You can do a coil binding job, and minutes later squeeze in a wire or comb binding project using the same primary punch. The high-quality precision die sets available with this machine will last for years of production. One die of your choice is provided with the unit. Fully Automatic Punching System with Digital or Manual Format Adjustment. 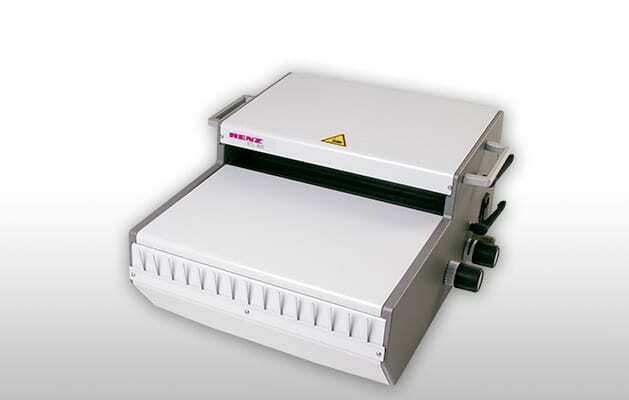 Offers shortest setup time for all types of special punching and loose-leaf binding operations. 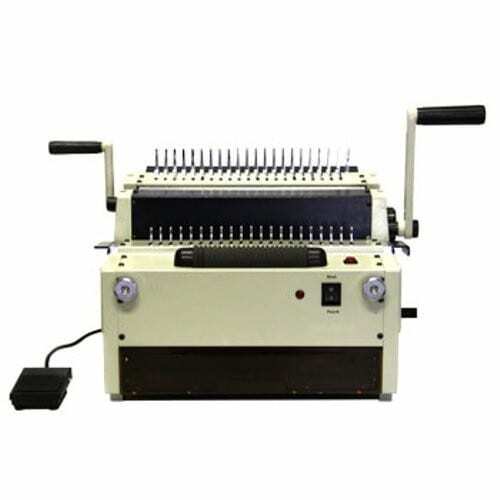 Semi-automatic Electric Desktop Punch System with Adjustable Paper Tray. The fastest semi-automatic electric desktop punch system in its class for small to medium size runs. 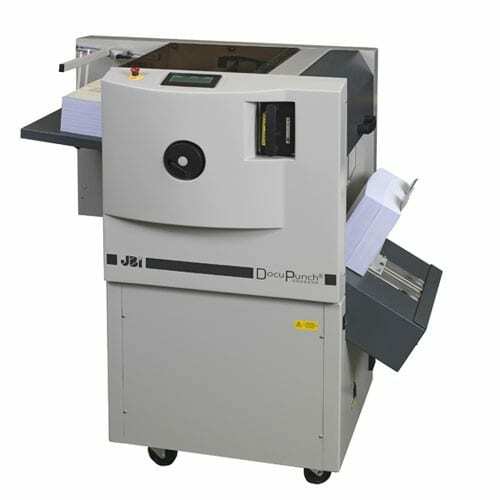 The DTP 340 A is the fi rst machine in it class to offer ease of operation, high output and fl exibility at an economical price for small to medium size runs. Electric Closing Machine with Integrated Hanging Device for Ring Wire. A fast loading electric closing machine for use in offi ces, copy shops and in-house printing plants. 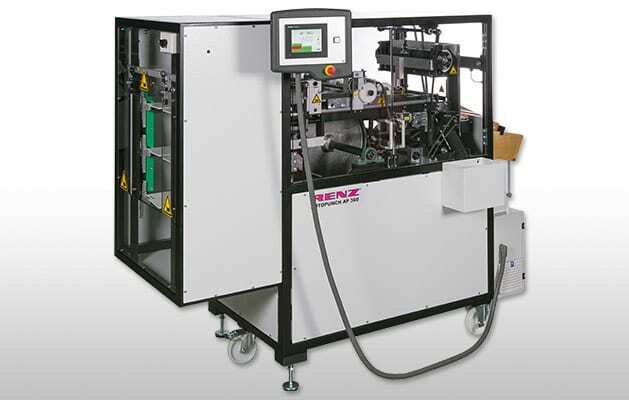 RENZ RING WIRE® Semi-Automatic Mobile Wire Comb Binding Machine. For book, skip and calendar binding. High-speed automatic punch capable of producing 30,000 to 40,000 punched sheets per hour. Punches preprinted, collated documents directly from your copier or printer (including mixed stocks from 16 lb. bond to 110 lb. index). Also punches tabs pre-collated into the finished sets. Tabs must have minimum 1/4” shoulder.Hands free operation means your operator is free to perform other tasks. Large selection of punch dies available. VERSATILE, HANDS-FREE AUTOMATIC DOCUMENT PUNCHING The remarkable ALPHA-DOC® MKIII combines the versatility and ease of an office machine with the speed and efficiency of an automatic punch -- for perfect holes every time. Simply load the tray, push a button and walk away for hands-free punching of pre-collated books, presentations, proposals, reports... and even tabbed sheets. offi ce photocopier. Quiet 110v Single Phase 60 Hz. No air required. Punches up to one million sheets of 8½” x 11” paper in just one 8 hour shift. Running at up to 8,400 cycles per hour, it is the fastest punch on the market. With a maximum punching width of 15”, the EX380 will punch an incredible variety of holes for Wire-O®, UniCoil®, spiral, VeloBind® or looseleaf document fi nishing, and has the power to punch virtually any type of stock and material. Punches preprinted collated documents with or without mixed stocks. Optional attachment to punch tabs collated into fi nished sets. Tabs must have a minimum ¼” shoulder. Will handle a sheet sizes from a 4 ¼” (punched edge) x 3 7/8” (non punched edge) to a max size of 15” x 15”. Punches virtually any type of stock and material for practically any application. Continuous paper loading speeds productivity without stopping the machine. Precise Control - Automatic sheet alignment with micro adjustment. Onedirection, one-level continuous sheet control. Heavy Duty Steel Dies feature guide posts for perfect alignment, quick pin access, and fl anged holes to help clear waste. Turnover Drum keeps pre-collated document pages in perfect order. 220v three phase 60 Hz 20A. 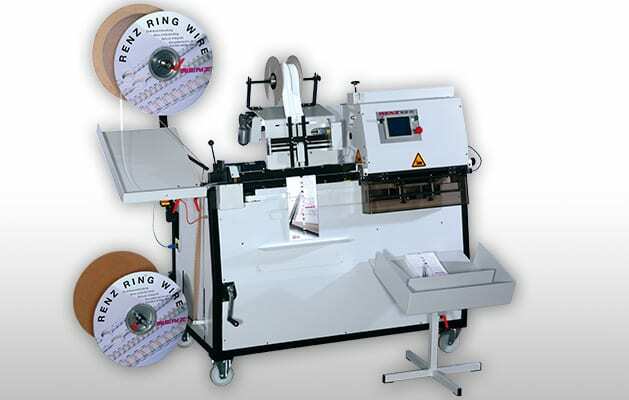 OMEGA-4 in 1 Heavy-duty 4-in-1 Punch & Bind Machine with Interchangeable Dies. The Tamerica Omega-4in1 Electric Binding Machine With 4 dies by Tamerica will help you stay on top of all your wire binding tasks. 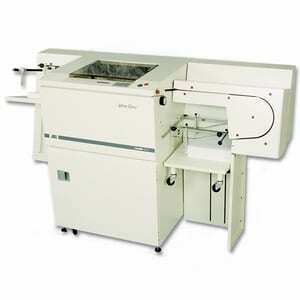 The Omega-4in1 offers electric paper binding up to 30 sheets (20#) and a binding capacity of up to 2". The Comb Comb, Coil (Oval), Wire (3:1 and 2:1) binding in the Omega-4in1, makes your life easier and reduces fatigue. Discover how the Tamerica Tamerica Omega-4in1 Electric Binding Machine With 4 dies can help improve productivity and your bottom line, today. It has a 1 year manufacturer warranty. 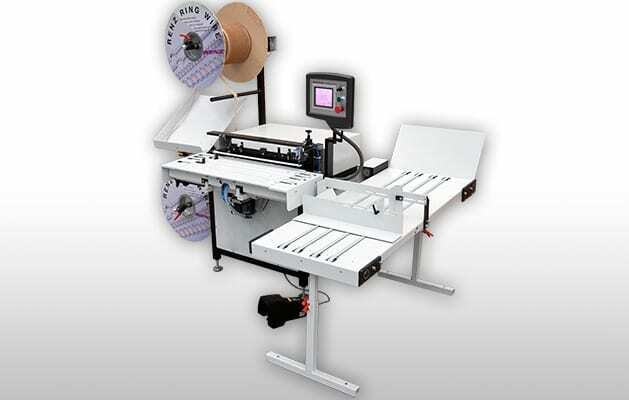 Heavy-duty 4-in-1 Punch & Bind Machine with Interchangeable Dies. 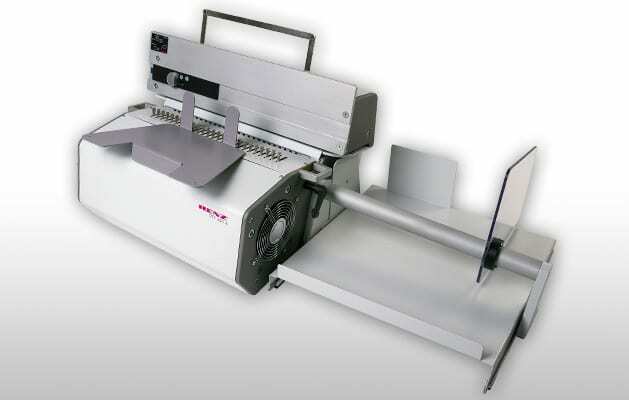 The new Tamerica Versabind-E binding machine offers an easy to use, all-in-one binding machine capable of binding combs, 3:1 and 2:1 wire, and 4:1 coil. 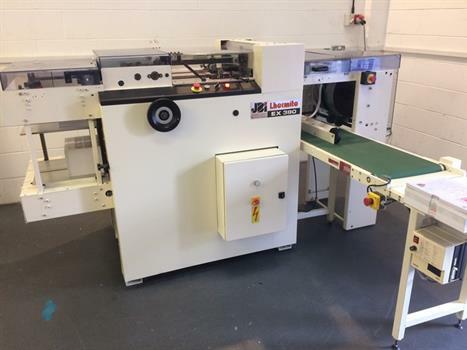 The Versabind E features an electric punch capable of punching 20 sheets of 20lb paper up to 14" in length and a manual binder and wire closer. Tamerica's "EZ Slide" interchangeable die system, 24 fully disengageable dies, punching depth adjustment, and a side margin control, allows the Versabind-E to be an easy to use, flexible, and convenient binding machine. 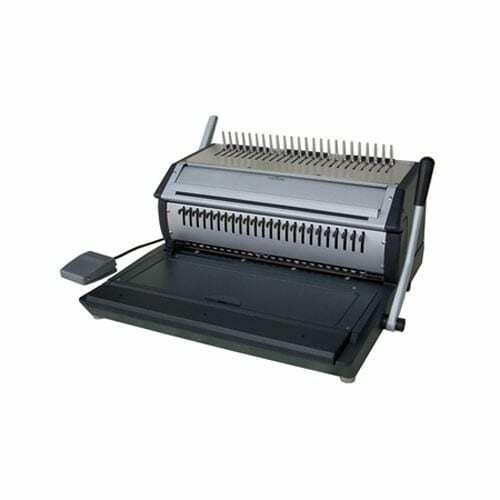 Fully compatable with all plastic comb binding, 3:1 and 2:1 wire, and 4:1 coil supplies carried by MyBinding.com, the Tamerica Versabind E will accomplish any task you have for it with ease.